A couple of weeks ago, in my review for “The Witch” I lamented the fact that the studios had turned their backs on the good old thriller while the rest of the world was embracing it. To prove my point, here comes South African director Gavin Hood with “Eye in the Sky,” a whopper of a political and military thriller starring an international cast and released by Bleecker Street, an independent distributor. Like some of the best thrillers, “Eye in the Sky” tackles a topical and even controversial subject –the use of drones to spy and even kill our “enemies” –, holds it to the light, studies it from every single angle and lets the audience draw its own conclusions while delivering edge-of-your-seat suspense. The brilliant script by Guy Hibbert asks all the right questions, provides no easy answers and takes its arguments and plot to its inevitably tragic and logical conclusion. The action takes place during the course of one day and in four continents. 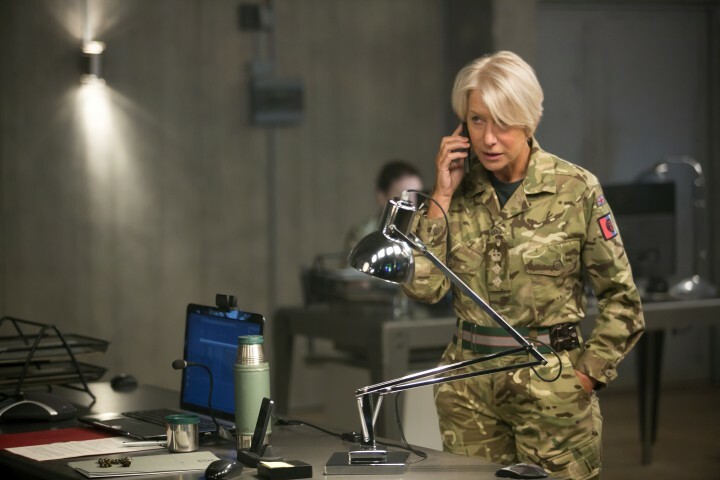 British Colonel Katherine Powell (Helen Mirren in full Jane Tennison mode) is in charge of a joint operation with Kenya’s Special Forces and the United States Air Force that will lead to the capture of two Al-Shabbab terrorists, one of them a British citizen, who are numbers four and five in Britain’s most wanted list and who are hiding out in a Nairobi neighborhood controlled by Islamist extremists. But the scope of the mission changes drastically from “capture” to “kill” when they discover that both terrorists are preparing two young men, a British and an American citizen, to carry out suicide bombings in Kenya. Powell and her next in command, Lt. Gen. Frank Benson (Alan Rickman in one of his last performances before passing away early this year) must now convince assorted bureaucrats on both sides of the Atlantic that “kill” is the way to go. Moral quandary number one: when is it justified to take the life of one of your own citizens? What will the political repercussions be? Who will accept responsibility? The government officials sitting alongside Benson in Whitehall bicker and debate until a decision is made to “refer up” (in other words, they pass the buck) and seek the approval of their Foreign Secretary (Iain Glen) and the U.S. Secretary of State. Even Powell has to deal with the military’s own bureaucracy as she has to consult the legal advisor assigned to the mission and he, too, tells her to “refer up.” Once the order to strike is finally approved, moral quandary number two rears its head: a little girl sets up a table to sell her mother’s freshly baked bread right outside the terrorist’s compound. The probabilities that she will die in the attack are high. Steve Watts (Aaron Paul), the drone pilot in charge, demands a recalculation of the risks. And the debate begins anew: which has more value, the life of one girl or the 80 or more that might result from a suicide bombing? Do we win the propaganda war by letting the suicide bombers complete their mission? And what if someone, in this day and age of Wikileaks and You Tube, finds out we did nothing to stop the bombing or that in doing something we killed one small girl? And then there’s that poor Somali anti-terror agent (Barkhad Abdi, “Captain Philips”) risking his life on the ground trying to find a way to save that girl’s life while the politician and military bicker in the safety of their air-conditioned rooms. Hibbert’s script also explores the repercussions these actions will have on the characters most affected by it. He introduces us to the child’s family, as they go about their daily chores and he gives us a sense of what must be like to live under the repressive control of extremists. And for Sargeant Carrie Gershon, Watt’s assistant (Phoebe Fox), this first day on the job will leave an indelible emotional mark (a hint at the high incidence of PTSD cases among drone pilots and co-pilots). Hibbert’s is also the rare script where characters are defined by their on-screen actions and decisions and not their backstories. There are no villains here, just people dealing (or not) with life and death decisions. Hood and editor Megan Gill seamlessly cut from command center to government chambers to underground bases to the dusty streets of Nairobi (actually South Africa), from debate to debate, giving the film a nervous energy, even when most of the scenes are dialogue-driven. We become participants in the debate while sharing Powell’s frustration as she watches the suicide bombers prepare. We are bounced back and forth between the pros and cons, acknowledging valid point after valid point; and we slap our heads in disbelief as we see some of these politicians wash their hands off the whole damn affair. Hood and Hibbert deny us a crowd-pleasing resolution. We know there will be consequences and can imagine what those will be. “Eye in the Sky” is smart, sharp and exciting, the kind of intelligent genre fare that should be the rule and not the exception. It is also a fitting tribute to Alan Rickman and a reminder of the void he leaves behind. The delivery of his last lines to a government official is classic Rickman, a piece of dialogue that will have many nod in appreciation to the complexities of the issues raised by the film and to Rickman’s acting legacy.